Braxton Davis is director of the N.C. Division of Coastal Management, which oversees the state’s coastal planning and permitting in 20 counties, as well as the N.C. Coastal Reserve. Past chair of the Coastal States Organization in Washington, D.C., he currently chairs a multistate committee on beach and inlet management issues. 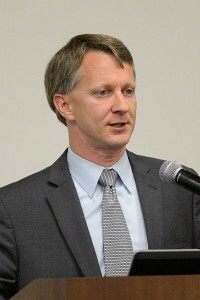 Previously, Davis served as director of policy and planning for the South Carolina coastal management program. He holds a doctorate in marine affairs from the University of Rhode Island, a master’s in biological sciences from Florida International University, and a bachelor’s degree in environmental sciences from the University of Virginia.